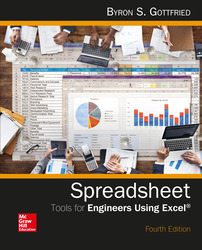 This practical text is a perfect fit for introductory engineering courses by successfully combining an introduction to Excel fundamentals with a clear presentation on how Excel can be used to solve common engineering problems. Spreadsheet Tools provides beginning engineering students with a strong foundation in problem solving using Excel. The first three chapters introduce the basics of problem solving and Excel fundamentals. Beyond that, the chapters are largely independent.